Sphaera specialise in the production of highly interactive simulated hydraulic systems, classroom trainers and bespoke CBT courseware (or eLearning) for generic, commercial or military aircraft. 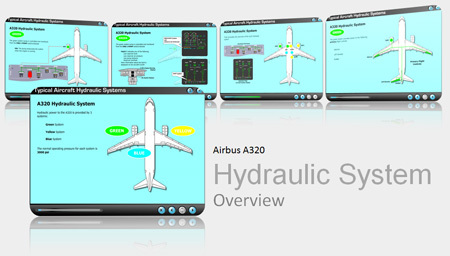 Our expanding range of hydraulic system courseware includes overviews of the hydraulic systems on the Bombardier CRJ200, Bombardier Dash-8 Q400 and Airbus A320. We are happy to work with schools or aircraft operators to extend the content to suit any specific training needs. System diagrams like the one shown on the right are typical of what would be included within a bespoke CBT course. Instructors or students can build up the diagram as a series of easy to understand steps, allowing function of each component to be explained as it is introduced. They are then able to demonstrate or view hydraulic flow and even explore inside hydraulic components such as hydraulic pumps, filters, valves, servo-jacks and to observe their internal operation. 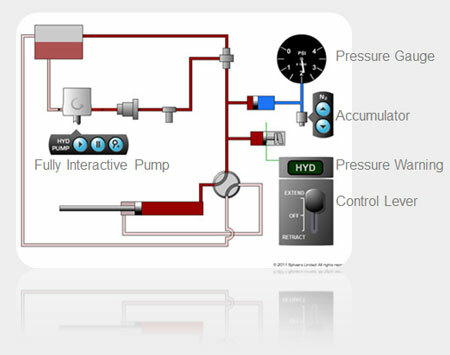 A generic aircraft hydraulic system. We also create fully functional control panels which can interface with schematic system diagrams (to learn about system operation) or used to practise associated flight management procedures (for flight training). For more information on basic hydraulic principles, see our online basic hydraulic principles lesson and associated quiz! This section also contains links to information on individual hydraulic system components.